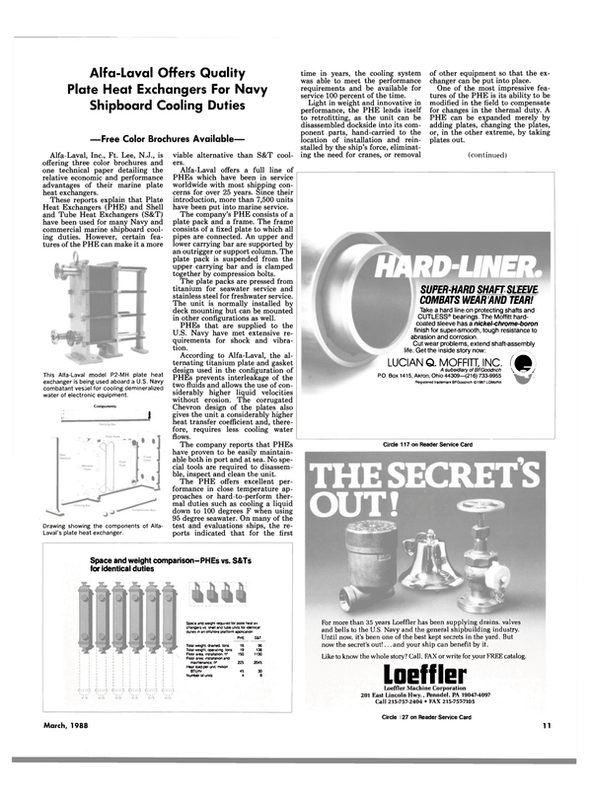 —Literature Available— Torque & Tension Equipment, Inc., of Santa Clara, Calif., recently announced a dramatic improvement and cost savings for expanding the Vi-inch, 3/s-inch, and 5/s-inch tubes for coolers, condensers, and heat exchangers on surface ships by using the MKIII HydroSwage Tube Expander from Haskel, Inc. Utilizing precisely controlled uniform hydraulic water pressure between two seals, this method is safe, fast, and economical. The MKIII Hydro- Swage Tube Expander, which recently was approved for use by NAVSEA for both new and retubing applications, can dramatically cut tooling costs associated with tube rollers for these applications. The MKIII HydroSwage Tube Expander, with digital pressure readout and control capabilities, is the result of 16 years' experience with hydraulic expansion techniques for expanding tubes into a tubesheet by applying uniform controlled water pressure in the tube ends. The pressure, or expansion force, is accurately set, measured, repeated, and controlled. This produces a better job in addition to being more cost effective. HydroSwage tube expanding normally takes place in two quick steps. First, the tubes are locked or set into their axial position. Secondly, in a matter of seconds, high pressure water is applied in the tube ends resulting in a leak-tight expansion. When doing the job right the first time at substantial savings is a valid concern, the manufacturer states, the alternative to tube rolling is the Haskel MKIII HydroSwage Tube Expander.